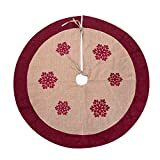 The diameter of the round tree skirt is 42 inch. Christmas tree skirt is made from top quality burlap. Red snowflake with rustic Red Border makes tree skirt lively. Place the perfect finishing touch under your Christmas tree.